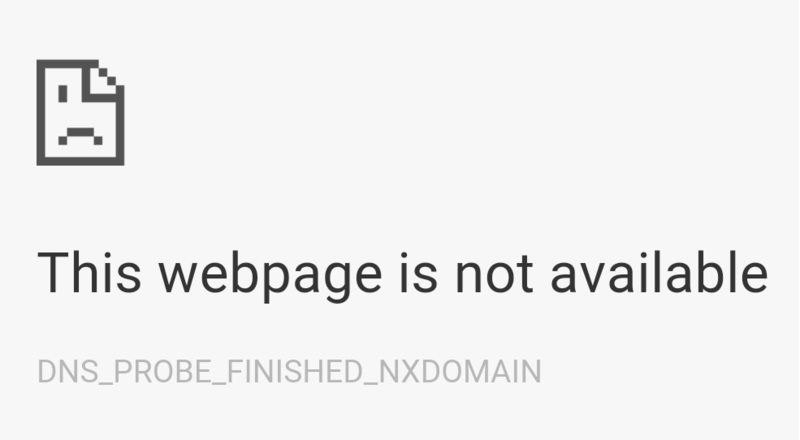 One of the many errors which bug us during our sweet internet journey is the DNS_PROBE_FINISHED_NXDOMAIN error. The DNS Probe Finished error is particularly familiar to the Google Chrome users which prevent them from accessing their favorite websites and connecting to other online services via their favorite Chrome browser. In this post, we will be discussing the DNS_PROBE_FINISHED_NXDOMAIN error and how to fix it. The DNS is the Domain Name System. By default, it is configured to work with the settings provided by your web browser, modem or the Wi-Fi router that you are currently using.This DNS allows your PC or your phone or whatever you are working with to connect with the rest of the internet. Sometimes, however, this configuration is altered or gets incorrectly configured by various programs that try to fiddle with your network settings in exchange for the sweet internet candy. This prevents the applications like Google Chrome from connecting to the correct ports by which it allows you to access the internet. The DNS_PROBE_FINISHED_NXDOMAIN error can also occur when you are using a custom DNS server to access the internet which is not provided by your ISP. So, in case you need to use a custom DNS server on your PC, make sure that it has > 99% uptime, otherwise, you’ll have a bad time. If the custom DNS is the culprit here, then you can solve the DNS error by setting the defaults for your system by going to the network settings. Regardless, if you don’t know what is causing the DNS probe error, continue to read below for the steps to fix it. Press Win+R keys to open the run dialogue. Type cmd in the run box to open the Windows CMD. Type the following commands in the command prompt and press enter. Now go to the Control Panel > All Control Panel Items > Network Connections and right click on your current active connection and select Properties. Click on the Internet Protocol Version 4 (TCP/IPv4) and open its properties. Select the Use the following DNS server addresses: and then set the Preferred DNS server to 8.8.8.8 and the Alternate DNS server to 8.8.4.4 and click OK.
Open the Google Chrome and type “chrome://flags/” without quotes and select Reset all to default. After following these steps, the DNS_PROBE_FINISHED_NXDOMAIN error will go away. But in case it doesn’t you can also try by clearing the cookies, history and cache from your browser. If any problem still persists, please put a comment below with the exact details of the problem you are having and we will surely help you out.